The not-to-be-missed concert of the year. 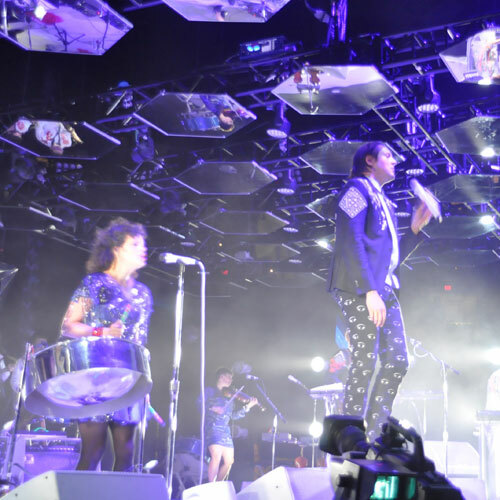 Ten years ago, Arcade Fire was mesmerizing crowds at intimate shows after the release of the band's debut album Funeral, a gorgeous set of songs shaped by death and renewal. The band has grown since its impressive beginning, entering the realm of mainstream awareness after taking Album of the Year honors at the 2011 Grammy Awards, moving the band out of small venues and into big arenas, which would mark a big shift for any band. Arcade Fire, however, was more than up to the challenge Sunday, March 16 at Quicken Loans Arena in Cleveland, as the band threw a party those in attendance won't likely forget any time soon. After dancing to a pair of short sets by DJs Kid Koala and Dan Deacon on a secondary stage behind the dance floor, those in the nearly sold out crowd turned their attention to a giant black curtain and waited for the Montreal musicians to appear. Soon, people dressed in formal wear and assorted costumes (stormtrooper, colonial citizen, and ninja Superman all included) began an "Arcade" chant to summon the band, prompting a man covered in mirror fragments (a Reflektor suit, so to speak) to announce the main act, and Arcade Fire responded in well, fiery fashion. The band kicked off with the blazing "Normal Person" off of their latest album Reflektor – which explains that Reflektor suit – with Win Butler, decked in a black and white suit jacket and black pants emblazoned with eyeballs, cooing "Do you like rock 'n' roll music, because I don't know if I do" to the crowd before an arena-sized guitar riff filled the building. If the band was looking to prove that they could pull off an arena show, then they accomplished that mission in just the first few minutes. Still, the show only escalated from there, as the band whipped out Funeral favorite "Rebellion (Lies)," leading into a sing-along paired with a blast of confetti that descended into the delirious crowd. 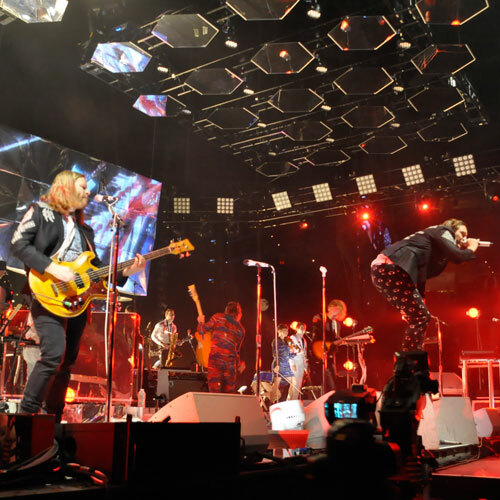 Arcade Fire skittered across its discography, visiting the Grammy-winning The Suburbs with a dreamy extended version of the album's title track before transitioning into a rocking "Ready to Start." The crowd provided extra heft to Neon Bible standout "No Cars Go," joining in on every "Hey!" shouted by the multiple members on stage. With all of the extra space provided in an arena, the band utilized the secondary stage throughout the night. After they finished captivating the crowd with the excellent Reflektor track "Afterlife," multi-instrumentalist Regine Chassagne sprinted out to the middle of the arena for "It's Never Over (Hey Orpheus)," belting the tune as the stage was raised in the air. It was straight back to the main stage for Chassagne after that, as she took to the mic once again to close out the main set with "Sprawl II (Mountains Beyond Mountains)" amid a dazzling light show – another area where the band took advantage of the arena's capabilities. After a short reprieve, Arcade Fire returned for the encore, unleashing a furious rendition of "Reflektor" to help incite a dance party across the floor and both seating levels. 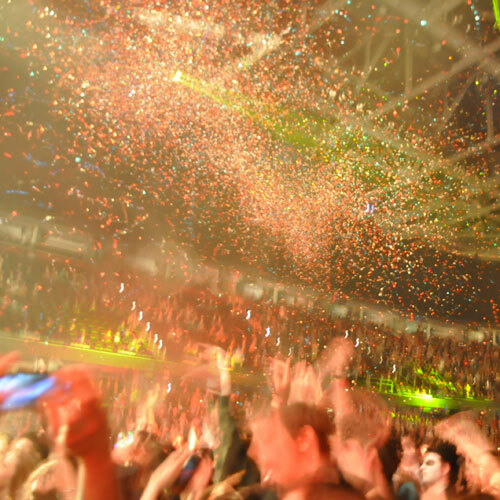 The arena kept moving when Butler returned to the stage wearing a box made of TV monitors for a cover of Devo's "Uncontrollable Urge," a nod to Devo's northeast Ohio roots, before Arcade Fire launched into "Here Comes the Night Time" with the help of a massive blast from the confetti cannons mounted in front of the stage. Once the colored squares settled, Butler announced one final song for the night, stating "If you sing this loud enough, the Miami Heat will lose in the Finals" before the band started playing the anthemic "Wake Up" from Funeral. And sing loud, the crowd did, matching the band word-for-word, even providing a particularly goosebump-inducing moment when Arcade Fire cut out to let the audience take over. And then, as Chassagne sang on "Orpheus," it was over too soon, as the band thanked the crowd and took their leave. The crowd, mesmerized for the past couple of hours, meandered out into the streets with rousing choruses still ringing in their ears from a heartfelt performance that shook an entire arena. Alex Bieler can't be found. He's lost amongst all the confetti, but if you want to buy him a Reflektor suit or chat about Arcade Fire, you can try reaching him at aBieler@ErieReader.com, and you can follow him on Twitter @Catch20Q.